Fancy yourself living like a Mermaid/ Merman in the exquisiteness of perfectly clear blue-green waters and undersea life? Fulfill your desires at Poseidon Resorts that offers the opportunity to spend every minute of their stay enjoying spectacular panoramas. 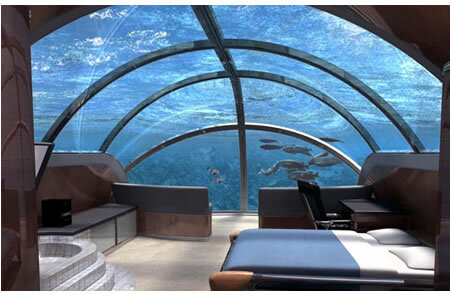 Set to be located on the actual sea floor, this stunning facility will offer suites with transparent acrylic windows allowing you to view aquatic life from the comfort of your own room. Fully pressurized for atmospheric comfort, the resort will also feature a 5-star rotating restaurant, bar, café, tennis courts, dive shop/water sports center (of course), library, luxury spa/hydrotherapy center, a tennis court, and( can you belive it?) a swimming pool too. Each suite will also have its own underwater lights controllable from an inside switch and an external fish feeder. 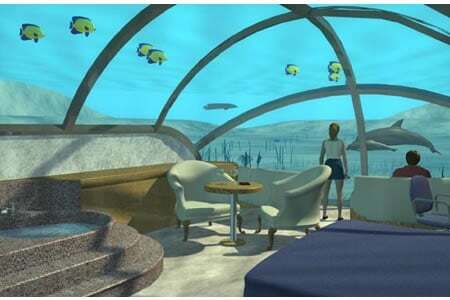 If you are worried about safety measures then chill cause every unit has a safety dome and an emergency diver’s entrance hatch. Scheduled to open in mid-2008 on a magnificent private island in Fiji, Poseidon will, without question, be the world’s most unique luxury resort, and certainly the only place where you will be able to pilot your own private submarine in our pristine lagoon.